George Villiers (30 January 1628 – 16 April 1687), 2nd Duke of Buckingham, 20th Baron de Ros of Helmsley, KG PC FRS, was an English statesman and poet. 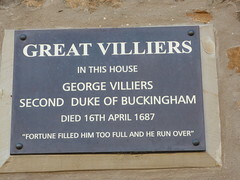 Great Villiers In this house George Villiers Second Duke of Buckingham died 16 April 1687. "Fortune filled him too full and he run over"